Reverence for the ancestors is fundamental within traditional religious expressions, this being veneration of saints, masses said for the dead, All Hallows celebrations or it bee bovedas, the cult of Palo Mayombe, Mysté Guede et Bawon or Ile Egungun. In many cases parts of the mystery is lost, leading to a limited understanding of what we are dealing with. Other times, the modern materialistic perspective distorts the western perception of what an ancestor is. If we turn to Africa, a continent the modern west still see as underdeveloped and crude, we find complexity and sophistication that is stunning. If we open the cloth of the cult of Egungun a dazzling network of consciousness is revealed. As Awo Falokun has pointed out several times, the word Egun is a contraction of ‘o egun’, which means “I am bones” while egungun is derived from the elision e ogun oogun, this carries the meaning of being a “medicine to become the bones of one’s ancestors”, or more literal, “the strength of medicine to be bones”. This means that bones are crucial; it is the bones that are the seat of the ancestral consciousness. And here enters the element that often generates confusion; whether egun refers to a specific ancestor or to the collective consciousness of ancestors . The particular ancestor of one’s family line is referred to as ara orun (dweller I heaven). When addressing ones family ancestry one is connecting to a particular part of one’s ancestral consciousness. This is good, but it also depends on the character of one’s ancestor, which is why it is so important to perform the funeral rites for the deceased ones, in order to facilitate an easy transition to orun and avoid that the ancestor gets earth bound. In the west we sadly enough often deal with ancestors who do not possess the consciousness to assist those that are left on earth. Likewise, we have the idea of ibi, of what is bad, generally, ibi can be said to be misfortune – what is left when Ire or fortune is not to be found… In the case of ibi Egun this shows itself in the destructive patterns of dysfunctional families. This is the consciousness of specific ara oruns that are transmitted as a legacy in the family. As should be clear from this observation, the west does suffer in this regard. 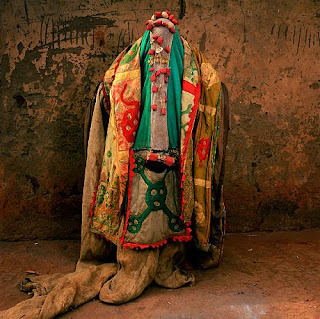 The veneration of ara orun is also at times called, Egúngún Bàbá which is connected to the line of paternal ancestral spirit; Often it is this kind of Egúngún that are coming down in the festivals together with the Aláso, which is often the case also in the Diaspora as for instance in the festivals celebrated in the island Itaparica in Brazil. Egungun on the other hand is not actually an ancestor. Egúngún Aláso is the deity that comes down during masquerade and is efficient in repelling malignant influences from the community in general. And not only this, Egungun was sent from Olodumare in the odu Oturupon meij and was assigned the task of generating stability on earth by opening the roads of communication between aiye and orun. The Odu also tells how this Imole entered the ground in order to become a stabilizing force for humans. One of the verses in this odu tells about the snail who, in serenity, was slowly being blessed with harmony, peace and all good things. The lack of bones in the snail Is interesting here as it is a direct reference to Orunmila, but this invites yet another complexity of metaphysical dimensions, so for now, let’s point out that the snail is both slow and sacred to Obatala and Odu. This tells us two important things about how we can enter into contact with both our ancestors and the collective spirit of death and stability. With patience and ori rere, or a content and calm consciousness we can become a living road towards the lost memory of generations upon generations of wise men and women. With a calm consciousness we can put our head to the ground and connect, because this is actually our birth right, perhaps the only one we have, the unveiling of ancestral consciousness.